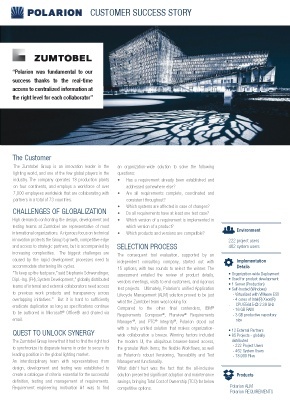 The Zumtobel Group is an innovation leader in the lighting world, and one of the few global players in the industry. High demands confronting the design, development and testing teams at Zumtobel are accompanied by increasing complexities. Polarion ALM won over internal and external collaborators as a complete ALM solution that catalyzes collaboration, reuse and best practice exchange.